Legazpi (Philippines) (AFP) – A giant mushroom-shaped cloud shot up from the Philippines’ most active volcano on Monday, darkening the skies and raining ash on communities where tens of thousands have fled after warnings of an impending eruption. Mayon volcano’s new activity prompted state volcanologists to raise the alert level one notch higher than the initial warning scientists issued last week, meaning a hazardous eruption is possible within days. Fine ash and sand fell on Legazpi, a city of about 200,000 people, and nearby areas after the midday explosion of Mount Mayon, forcing motorists to turn on their windshield wipers and headlamps, an AFP video stringer said. 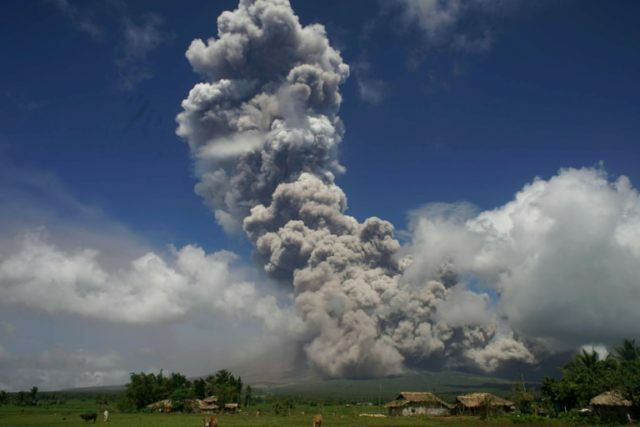 Live local television footage and photographs showed the ash column rising several kilometres (miles) above the volcano, blotting out the sun in a largely agricultural region some 330 kilometres (205 miles) southeast of Manila. “I had to stop because my helmet had filled up with ash,” local housewife Girlie Panesa, 39, told AFP as she parked her motorcycle by the roadside in nearby Ligao town. She asked for water from bystanders to wash the cement-grey ash off her helmet visor and said she plans to drive home despite the hazardous conditions because her teenage daughter was alone in their house. Mayon, a near-perfect cone, rises 2,460 metres (8,070 feet) above Legazpi and is considered the most volatile of the country’s 22 active volcanoes.